WILL DISNEY CHANGE TOM SAWYER ISLAND? 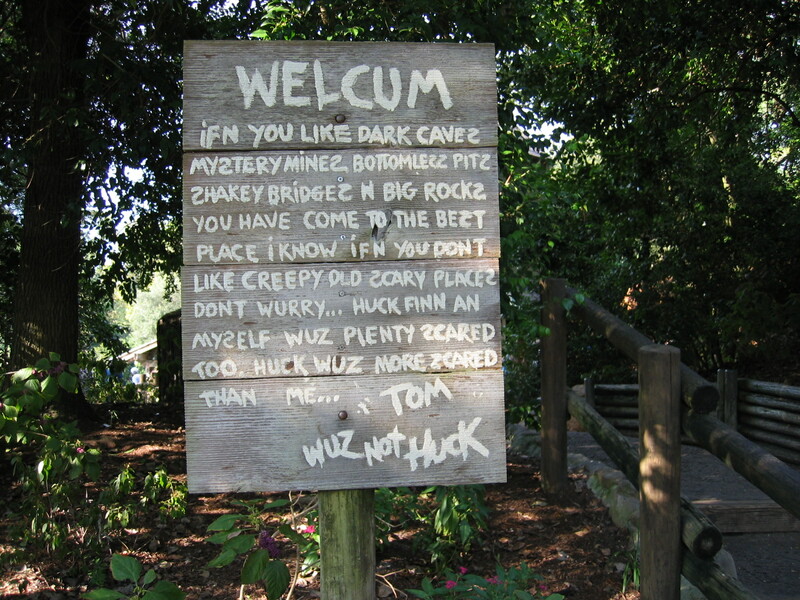 The welcome sign on WDW's Tom Sawyer Island in 2005. With regard specifically to Twain, Huckleberry Finn and Tom Sawyer, this word isn’t just in Twain’s books. It happens to be on many of the signs of the Walt Disney World Magic Kingdom/Disneyland Frontierland Attraction, Tom Sawyer Island, so as we visited the Island in the parks as a kid, I simply took it as bad spelling among all the other badly-spelled words. These signs lend to the charm of the place. Visiting the Island is stepping into Huck and Tom’s world (it’s even rumored that the island itself has a Missouri zip code). Consider the following signage (in some places, the letter ‘S’ is backwards; I’ve denoted that here with a *). IF’N YOU LIKE DARK CAVES*, MYS*TERY MINES*, BOTTOMLES*S* PITZ, S*HAKEY BRIDGES N BIG ROCKS* YOU HAVE COME TO THE BES*T PLACE I KNOW. IF’N YOU DON’T LIKE CREEPY OLD S*CARY PLACES* DON’T WORRY……HUCK FINN N MYSELF WUZ PLENTY S*CARED TOO. HUCK WUZ MORE S*CARED THAN ME. 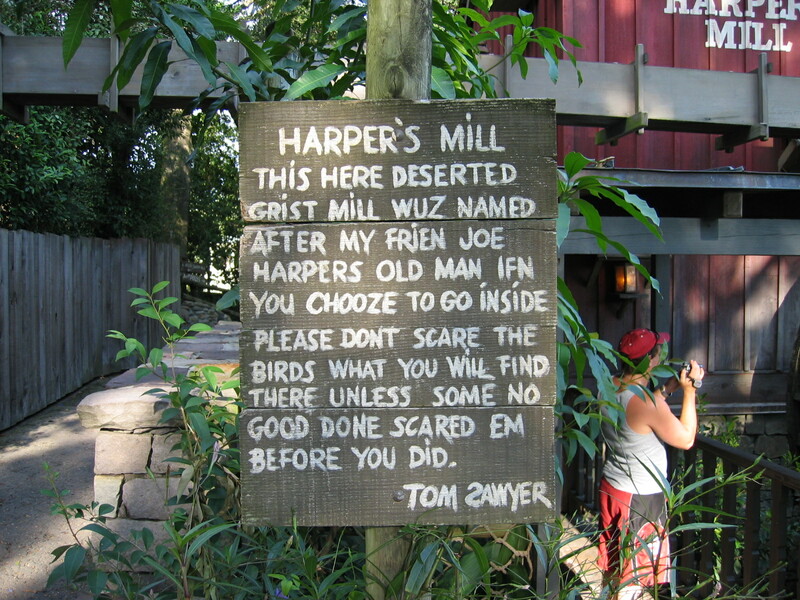 The Harper's Mill sign, WDW's Tom Sawyer Island, 2005. THIS HERE DESERTED GRIST MILL WUZ NAMED AFTER MY FRIEN JOE HARPER’S OLD MAN. IF N YOU CHOOZE TO GO INSIDE, PLEASE DON’T SCARE THE BIRDS THAT YOU WILL FIND THERE UNLESS SOME NO GOOD DONE SCARED EM BEFORE YOU DID. I HAVE EXPLORED MANY OLD MINES, BUT THIS UN IS THE BEST EVER! STRANGE THINGS HAPPEN IN HERE TO KEEP A SHARP EYE OUT AND DON’T STOP FOR NUTHIN! 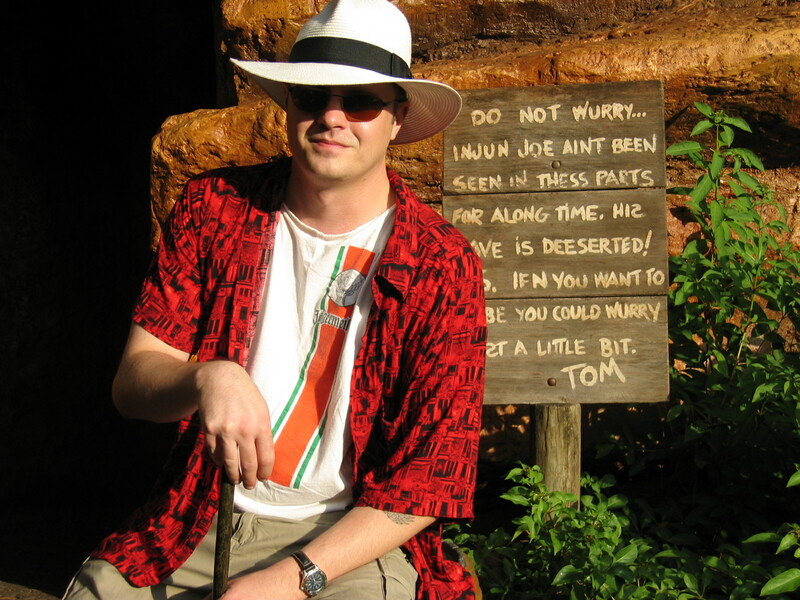 Nathan--swear to God, the world's biggest Twain fan--in front of Injun Joe's Cave warning sign on WDW's Tom Sawyer Island, 2005. INJUN JOE AINT BEEN SEEN IN THESS PARTS FOR ALONG TIME. HIS* CAVE IS DEESERTED! P.S. IF N YOU WANT TO MAYBE YOU COULD WURRY JUS*T A LITTLE BIT. While it looks as though the controversy is dying down a little bit and it appears, from all the news and blogs I’ve been reading, that most people are not liking this new edition of the book, it does makes me wonder: If this becomes widely accepted, what is Disney, in the wake of all this, going to do about the signs on Tom Sawyer Island? INDIAN JOE HASN’T BEEN SEEN IN THIS AREA IN MANY YEARS. HIS CAVE IS DESERTED. P.S. : IF YOU’D LIKE, YOU COULD WORRY JUST A LITTLE BIT. I somehow suspect that if that happens, visiting ‘Indian Joe’s Cave’ just won’t be the same. 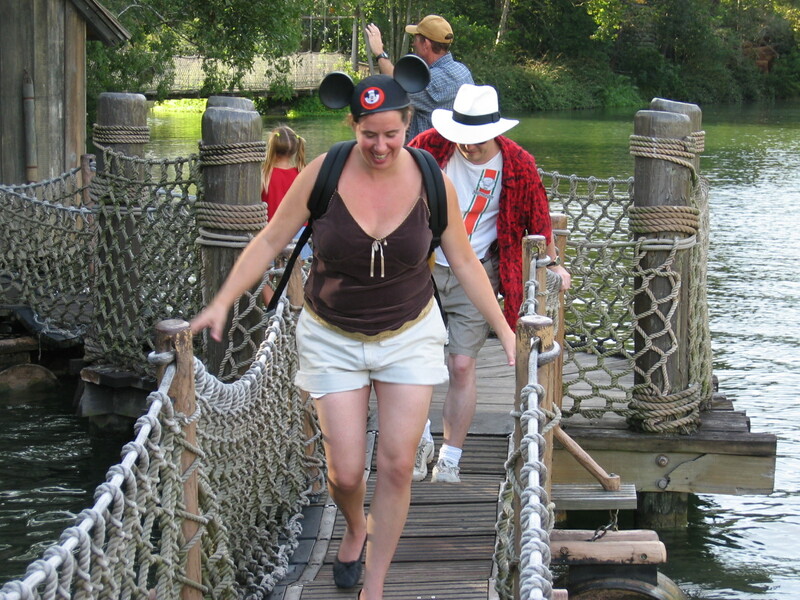 Me, in front, and Nathan, in the hat, navigating that crazy barrel bridge on WDW's Tom Sawyer Island, 2005. ← HEAR HAUNTED DISNEY TALES ON DARKNESS RADIO!